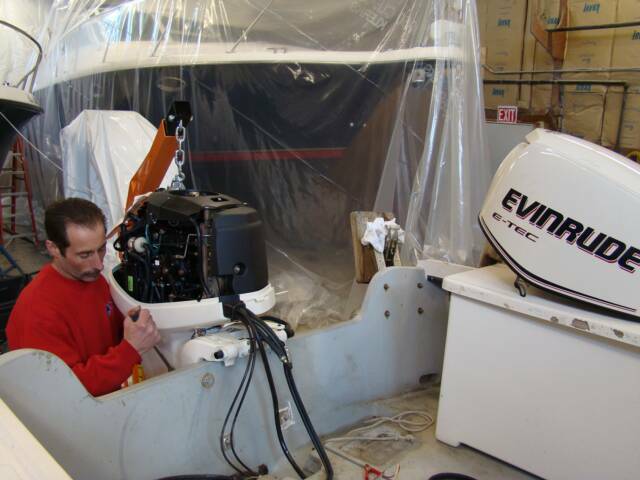 Our outboard mechanics are trained annually in the latest technology. We are a BRP dealer, specializing in Johnson and Evinrude, which are two names that have been around since your Dad was a boy. Contact us for a competitive price quote on a new motor, maybe an E-tech! We have a winterize and storage program for engines up to 40hp. With this service the engine is winterized, gear oil changed, engine is flushed and protected and stored for the winter. In the spring, call us one week in advance and we will ready the engine for your summer use. We also service all other makes of outboards, both 2 cycle and 4 stroke engines. We perform routine maintenance and troubleshoot problems. We stock a large variety of parts including some vintage OMC parts. Contact us at (508) 993-9232 ext. 15 or click on the email link below.